Tori performed in Erie, PA on Wednesday, March 19, 2003 at Warner Theatre. The opening act was Rhett Miller. Back in 2001, I was in Washington D.C. to see Tori perform, and that coincided with the U.S. attacking Afghanistan. This time the war with Iraq began while I was seeing Tori in Erie, PA. My girlfriend Amanda's mom left a message on her cell phone during the show, and we found out as soon as the show was over that the war had begun. It seems odd that Tori shows and world conflict would combine so often in my life. Being there was oddly reassuring during such a scary time in the world. In a way, it seems trivial to report on a concert during such a conflict. But at the same time, it is good to concentrate on something other than the news right now. I attended the meet and greet and was able to get some photos of Tori from the back. I include one to the right. One strange thing that we noticed was the fact that the balcony in the Warner was closed. Anyone who had seats there found themselves being reassigned to the floor. A few people who had front row balcony seemed upset when they suddenly found themselves way back on the floor. I am sure others were pleased with the change. Weird. I am not sure how Tori can continue to perform such excellent and varied shows. This is the 4th show we have seen in a row. They have all been excellent and greatly different from one another. If anyone earlier in the tour complained about Tori's set lists being static, then they have no logical reason to do so now. The shows have been varied, and there have been amazing debuts each night. Tonight was the first time ever that Tori performed the b-side TomBigBee and the first time on this tour that she did the cover She's Leaving Home. There were also some rarer songs, and some interesting changes with where she sang certain songs during the show. Right after a sorta fairytale, Tori hit us with a rocking version of Strange Little Girl. Tori never did this song during the last tour when this was a single, so it is good to see her doing it now. No doubt she wanted to wait until she had a band to perform it. Tori then performed God and then said to the crowd, "Hey, how's it going. So we said we'd come back to Erie... We always keep our promises. I heard there's a ghost in this place.... I hope he comes with us." She then introduced the band. I was surprised that the next song was Father Lucifer, and not Cornflake Girl like it has been the last few shows. During Father Lucifer, Tori added the words, "In these crazy times, you never looked so sane." Interesting commmentary on current events I thought. I was surprised to hear Precious Things so early in the show. Tori was energetic and intense during this one, perhaps the most I have seen her on this song on this tour. Honey was absolutely gorgeous as well. The band came back and she ended the Roadside cafe with Purple People, which really seemed to delight the crowd. A few songs later, she really shocked us with a performance of the b-side TomBigBee, the first time she has ever performed this. It sounded excellent and Tori kept smiling really huge during the song. She stood and played both the wurlitzer and the Rhodes during that performance. Even Iieee sounded extra special tonight. It is interesting how she almost lies horizontal on the piano bench at the start of this one. The way she holds her microphone between two fingers is also fun to watch. It truly was an excellent show. Even the encores were surprising with Siren and Cornflake Girl (which usually comes earlier in the evening) being included. One has to wonder how long Tori can continue to do this. Even people who are normally hesitant to heap praise on every show agreed that this concert, and the last few, have been first rate. I can hardly wait to see what will happen now in Cincinnati! This was an AMAZING show! I nearly fell out of my chair when she played SLG, Enjoy the Silence, Father Lucifer, i i e e e, and especially Siren. This was my 8th Tori show and I've NEVER seen her do some of these songs. Tombigbee was a great song, and I got a T-shirt that had the track listing to Scarlet's Walk on the back of it, along with the titles of 3 or 4 B-sides. We had the best seats, too.... Dead center, on the floor, about 20 rows back. Tori's been touring now for 5 months, and she's still going strong. I don't know how she does it. I honestly can't even put into words how simply awesome this show was. It's the third time I've seen her how this tour, and on a scale of one to awesome, it was super great! Hehehe. Seriously, though, it was one of the best shows ever! Our seats were beautiful, perfect. I was just so excited to be there, and I never thought I would ever go to Erie, PA.
After a sorta fairytale, Tori turned to the Rhodes/Whurly and began playing some familiar notes that I recognized really well, but could not immiately place what they were. I just sat there for a few moments and Michael leaned over and actually had to tell me that was Strange Little Girl. No wonder I couldn't place it, I didn't think I would hear it. Being the single from Strange Little Girls, I wondered why she never played this one on the 2001 tour. I guess she wanted to have the drums with her. They really did add a lot. I found this song to be quite different live than on the album. I could hear Tori's keyboard and voice a little better than I recall hearing on the album. I also noticed that she was dancing and moving her hips in a really fun way for this song. I was impressed...already the mood of this show demonstrated Tori's very high energy. Tori played God and then said to us, "Hey, how's it goin?...so we said we'd come back to Erie...we always keep our promises....I heard there's a ghost in this place (she looked up toward the empty balcony)...I hope he comes with us..." Then she introduced the band to us and played Father Lucifer. Somewhere in Father Lucifer, I noticed there was a line that she changed or added to say, "in these crazy times" which brought some thoughts of the war to me. The show moved along very high of energy and power. When Matt and Jon left after Wednesday, Tori sang her little sign improv, "today we still have our time...I still have my sign...it lights up sometimes...today....different songs come out to play these days...like you don't know where it's all gonna go these days...songs they come...they ask to come to play." Then Tori played Enjoy the Silence, which I think I am the only person who adores this song. Michael reached over and took my hand. "All I ever wanted, all I ever needed, was here in my arms." I personally had some heightened emotion during this song. Then she played Marianne, which I rarely get to hear, and I loved hearing it and it just propelled my emotional feel even further. The last song of solo time Tori began a very subtle, quiet song that I did not recognize at all. I looked at Michael and he gave me a look that said he didn't know it either. Tori had a very emotional and very serious look on her face as she sang this song. I listened very closely to the lyrics which were very crisp and easy to understand. It was a beautiful and powerful song that fit perfectly after Marianne. About halfway through this song, Michael leaned over and whispered the title of the song, "She's Leaving Home." It was so gorgeous. When the band came back out, Purple People was played. I love this song and the addition of the band really does a lot for it. Tori then followed this up with Girl and Virginia back to back. Both of these are again favorites of mine, and I was so happy to hear them, especially back to back. Next Tori turned to her Rhodes/Whurly and began a really intense song that again, I didn't know what it was at first. She was moving up and down on her piano bench and smiling and screaming lyrics into the microphone. I suddenly recognized it, but could only place it as TomBigBee, but thought there was no way she could be playing that. Then Tori said the words "TomBigBee" into the microphone, and I knew she really was playing it. I have to say that this was probably the most fun Tori song I have ever seen performed live. She was really smiling and dancing and she looked at Matt and Jon a lot, and they were smiling and freely moving about and looked like they were having a great time. Matt even smiled so much, he showed teeth. It was great fun and very very energetic. It was around this time that I felt my cell phone vibrate. I knew who it was. My mom had promised me that she would call me the moment the war began, no matter what. I knew that was her calling me to tell me that the war had begun. 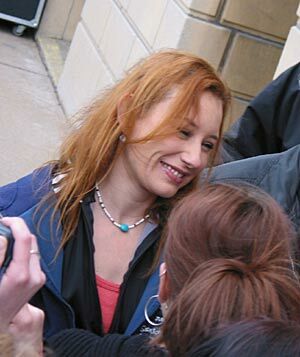 There I was sitting front row center in Erie, PA watching Tori Amos in concert and the United States had just went to war with Iraq. It left a weirdness in me and I felt very emotional and oddly comforted being at that show during that time. I was wondering if, for the encores, Tori would maybe change the set to sing something relating to war in some way. But I think that was for Indianapolis the night before. Erie was for leaving those thoughts to rest for a while and having a good time. But the emotions were there as well...they could not go away totally. The encores were a bit different than normal though with Siren there late in the show, and which I was loving to hear again and also added to the funness of the show. Mrs Jesus was also a surprise to end the show with. I like this one live better than the album and I was happy to have that end this show. After the concert, we were all in a shock that Tori pulled off such an amazing and incredible show two nights in a row. I mean, no Tori shows are bad shows, in my opinion, but some are exceptionally "wow" and we had just had two in a row like that. I also got a look at the official writen set list and discovered that Alamo was slated to be in the solo songs. I was kind of disappointed at first. Alamo is one of my top three favorite b-sides. But then I found out that it was replaced with She's Leaving Home, and I was glad that change was made. She's Leaving Home was a song that just seemed really fitting in there. Tori knows what she is doing.